Are your performance and outcome-based contract cycle times too long? Are you unsatisfied with the terms and conditions of your complex relationships? Are you seeing value leakage or a loss of overall deal value? If you answered yes to any one of these questions your team may not have the skills to successfully document, negotiate and manage complex contractual arrangements. If it is up to you and your team to document, negotiate, and manage performance and outcome-based commercial contracts, you’re in the right place. Imagine faster contract cycle times, better terms and conditions, higher overall deal value, and better performance. And, then imagine team members who we able to get those results while also confidently working with various stakeholders. Now imagine that same team effectively identifying and analyzing risk. Too good to be true? Those outcomes are absolutely obtainable! My clients have achieved these results and much more. I deliver proven results. Read some case studies now. My client went from being a self-conscious, average negotiator who had not negotiated large deals in her role to promoted to manage a team of 3 in a 9 month timeframe. She and I co-led negotiations for a very complex deal with a Multi-national supplier. The results are impressive: $8.5M in savings to her organization, and it closed in a record 3 ½ months. I offer three services to help contracting professionals achieve proven results by moving from technical awareness to mastery of commercial contracting practices for performance and outcome-based agreements. 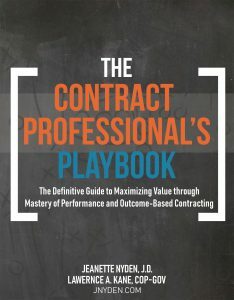 Contract professionals often have technical awareness and even some understanding of the contract techniques regarding performance and outcome-based relationships, but not all professionals can consistently implement and master the techniques. That’s why your organization might be experiencing long cycle times, unfavorable terms, a loss of overall deal value, and performance issues. (Contract professionals go by many titles: contract negotiators, contract administrators, contract managers, account managers, vendor/supplier/customer managers, and technical SMEs). This web-based, self-paced program answers 12 “How do I” questions to enhance commercial contracting competencies for performance and outcome-based contracts. The program uses videos with case studies, tools, and live Q&A sessions. This program is perfect for one person or an entire team of professionals who develop, negotiate and manage performance and outcome-based relationships. The program offers 12 videos with case studies, more than 25 checklists and spreadsheets, a comprehensive manual, and 12 live Q&A sessions. Learn More. Customized, tactical in-person training and coaching programs are specifically designed based on the results from my contract negotiation skills assessment, participant interviews, and contract reviews. Unlike the web-based program, each in-person program offers customized content, customized role plays, and customized case studies. Learn more. As a mentor, I sit as a credentialed adviser at the negotiation table to co-lead very complex negotiations. I work as an integrated team member teaching and coaching my co-negotiator through every step of the contracting life cycle, while also providing a safety net for my client organization. Learn More. Want to sample a training video? Check out my free New Rules for Negotiating 10 Minute Learning Sessions. You’ll get 10- minute webinars and handouts. Get access to Articles, Industrial News, White Papers, Free Learning Sessions and YouTube Video clips with great tips and techniques to negotiate stronger contracts! Visit my How I Can Help page to learn more or email me to set up a time to talk. Let’s set up a time to talk about the specific financial, operational and emotional upside to enhancing your team’s negotiation skills.